The tiles were 10% asbestos! Had we sealed our fate? Were we going to die a horrible death from lung cancer from this huge mistake? 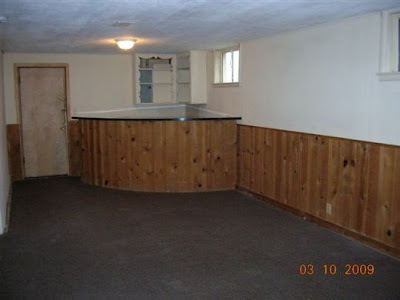 And how in the world were we going to get the rest of the tiles out of the basement without further exposure? We were stumped. 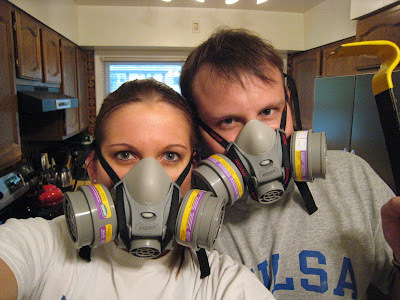 What WERE we going to do about the halfway-demoed asbestos in our basement? We did some internet research on the subject. Asbestos products like ceiling tiles and floor tiles are not dangerous unless a person intends to remove them (like us), and then only if the tiles break apart and the miniscule asbestos products get in the air where they can be inhaled. If we hadn't ripped out the carpet (whose glue caused the tiles to break up and tear apart), we could have lived for years without any danger. 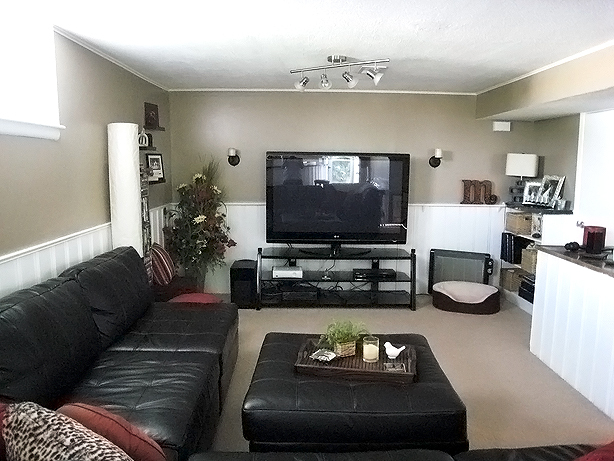 In fact, if the carpet hadn't been glued down, we could have easily replaced it and installed new carpet right overtop of the existing tiles and never had a problem. 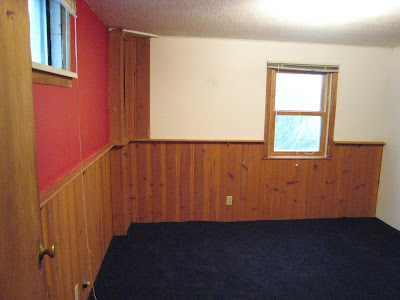 As it was, that carpet HAD to go (because a huge mold colony is a teensy bit of a problem and major health hazard, too). And of course it ripped up the tiles it was glued to in the process of removal. And of course the tiles that got ripped up did break apart, into millions of tiny pieces. And of course those pieces/particles floated around the air. Of course. So, in hindsight, we didn't have alot of options except to completely remove the tiles anyways. Which would've been fine - if they didn't contain asbestos. It is highly recommended that once a homeowner stumbles upon asbestos in a tile that they either leave it alone or get a professional to come and remove it. Unfortunately for us, most of the damage was already done, and we didn't see the need or have the money to hire spacesuit-clad professionals to come finish our demo job. They use all sorts of high-tech technology (like fans with particle sensors and lasers) to make sure that all the asbestos is entirely removed - it takes them days to remove it, and believe me, it is EXPENSIVE to have the pro's do it. Like up to thousands of dollars a day. All things considered, we weighed the risks vs. benefits of hiring pro's to finish the last 20% of the job (and de-contaminate the rest of the basement), or just do it ourselves. Being true DIY-ers at heart, we decided to finish this job up ourselves. We turned to a DIY-ers best friend, the internet, for some tips on how to handle asbestos containment and removal. 2) To keep the asbestos particles from getting in the air, mist the tiles with a water sprayer before demoing. The water will weigh down the tiles/particles and prevent them from becoming airborne. Keep misting throughout the demo work. 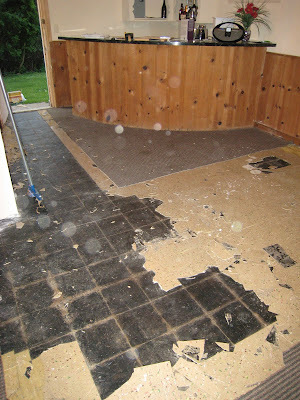 3) Once all the asbestos tiles are removed, CLEAN that whole area like you've never cleaned before. We used a diluted bleach solution to help remove both the asbestos and any remaining mold residue/spores. We cleaned the floor (many, many times), walls, and ceiling. 4) Invest in a heavy-duty particle-filtering air filter. I believe we found one that filtered asbestos. 5) Dispose of the asbestos tiles properly. 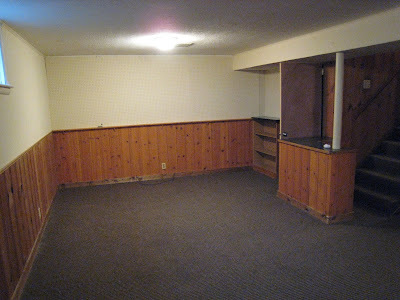 Using these simple methods we were able to finish the job on our own and get the basement finished! After reading many articles, we found that the danger of developing lung cancer from short-term asbestos exposure is extremely low - the real danger lies in repeated exposure and inhalation of asbestos particles in a day-to-day basis over the course of years. For instance, a construction worker who repeatedly demolishes asbestos products everyday for years would have a much higher risk of developing lung cancer later in life. So for us, we're probably going to be a-okay. Whew! Did I mention that this was our first big project that we tackled in the entire house once we became homeowners? Talk about getting the worst of it overwith first! 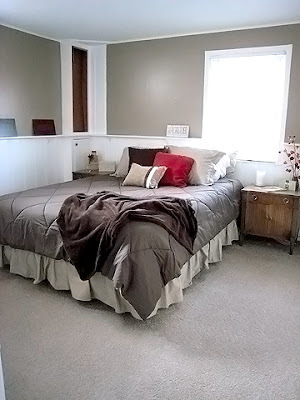 Everything we've done since then has been extremely easy - I guess once you've been terrified for your life from a home improvement project nothing is too difficult or scary anymore! 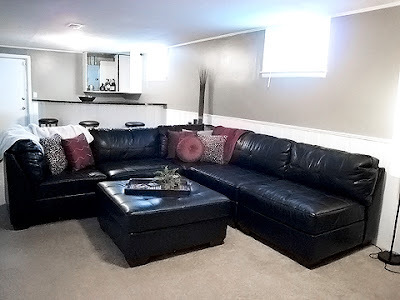 Was our basement remodel worth all the trouble (and unknowing life-risk, haha!)? Plus, we can actually stay down there now for 20 minutes without getting a headache. Yeah, that's right - screw you, mold! Moral of the story: Know what asbestos tiles look like (usually 9x9" vinyl tiles, but can be other sizes), and investigate BEFORE you take a hammer to 'em. Because if they do contain asbestos, it will probably be much, much easier - and cheaper - to just leave those babies alone! How about you? Have you ever had a run-in with asbestos? Did our story scare you silly? Are you surprised that we're still DIYing things after that crazy fiasco? We sure are! When removing the linoleum floor in my kitchen, and even though the house was built in 1982 (after asbestos was banned from building materials), I was still terrified at the thought of asbestos in the sheet vinyl/linoleum on the kitchen floor. T too started ripping it up before the idea creeped into my mind, since after all I was comforted by the fact that the house was built after it wasn't supposed to have been used. I spent HOURS on the web to realize that my fears weren't entirely unfounded - there were still some asbestos products manufactured during the 80s (though pretty rare). What's fantastic is that the major manufacturers like Armstrong (if it was built in the 70s/80s, you likely have their products in your home) have pictures of the styles that contained asbestos available on many sites. See HERE for a great example. I'm glad to know you guys are probably safe, and that I am (probably) too. The basement remodel results sure look like it was worth the risk! Great job. Wow! What a transformation... and alot of work! Glad you are free from the asbestos! Wowzers, that is some CRAZY stuff! Yikes. But most definitely worth it - it looks awesome now!! Thanks for the insight! I was going to cough up thousands of dollars to get the project done, but I'm thinking about tackling it myself.